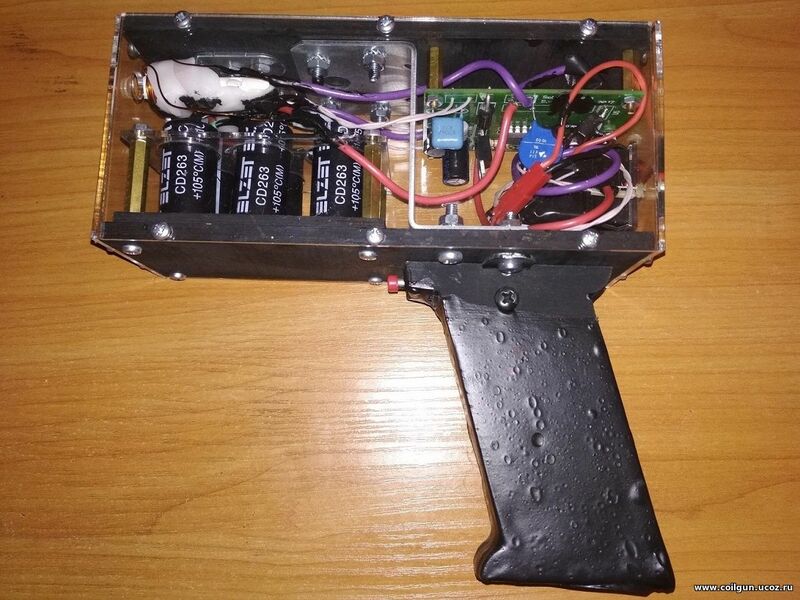 This simple coilgun was made for my little 3-form son who had something like contest on physics at his school. It was good relief from more complicated EM-4 project. The development didn't take a lot of time because all basic units had been tested before. 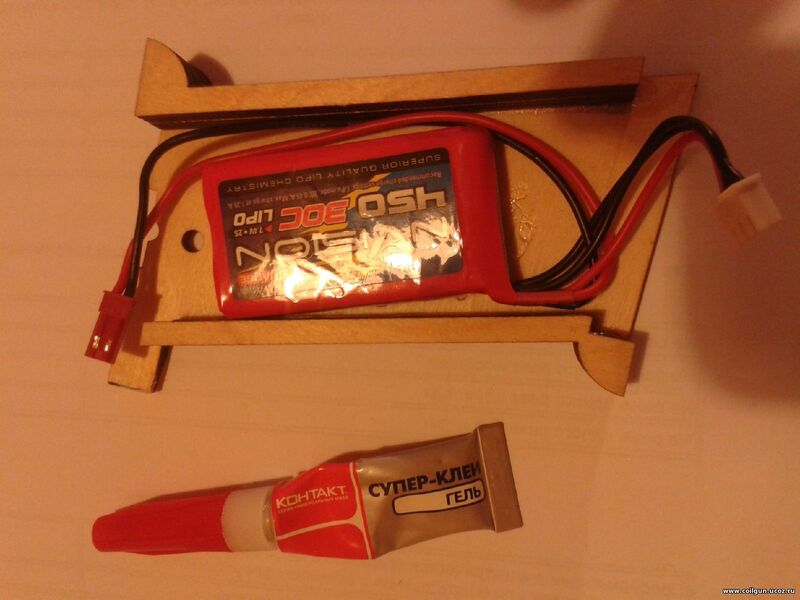 One-stage scheme commutated with MOSFET was used accomplished with LM78S040-based converter boosting up to 63V (which preserves safety enough to be handled by children). Principle scheme of EM-5 is given on fig. 1. Fig. 1. 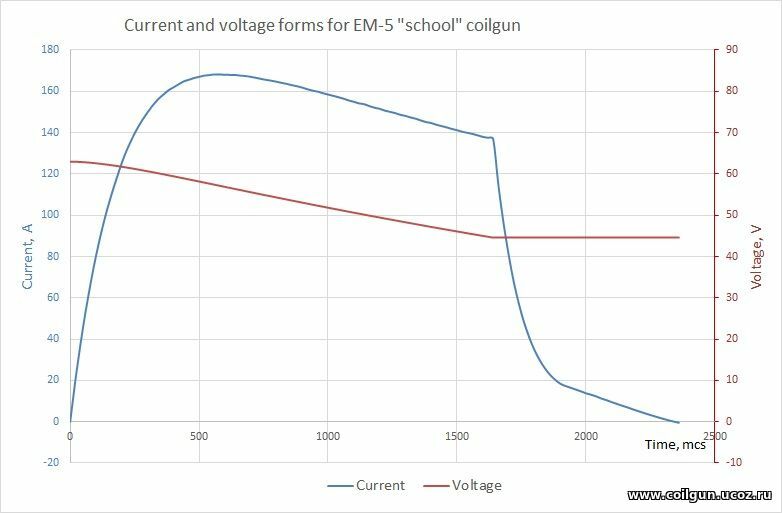 Scheme of EM-5 "school coilgun". The controllable switch eliminates the need for converter-strobing circuits (which stop the booster during a shot) and power diode (which is conventionally mounted on caps). Only one indicative element is incorporated (D1 LED signalling that caps are ready for shooting). 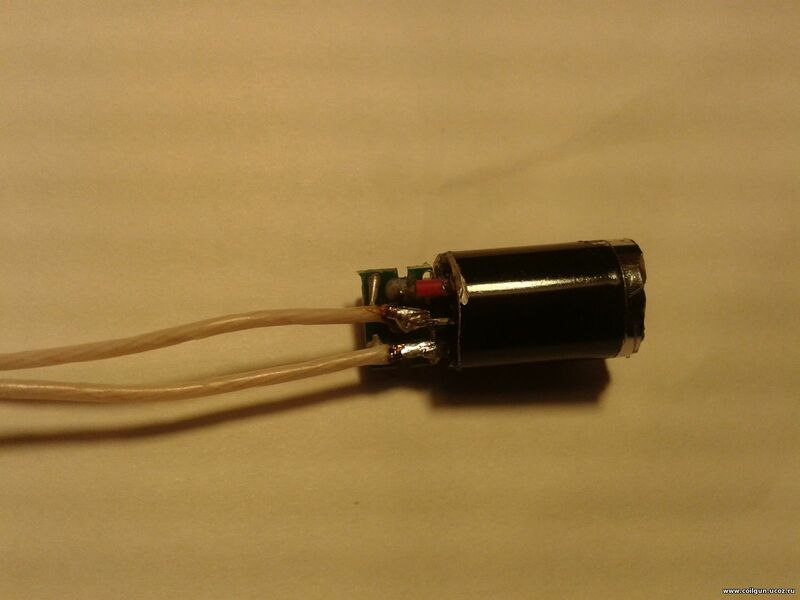 Any accu is suitable in range of 5...16 V and nominal discharge current 1-2 A (I used 7.4 V Li-Po, connected through backlighted toggle switch). 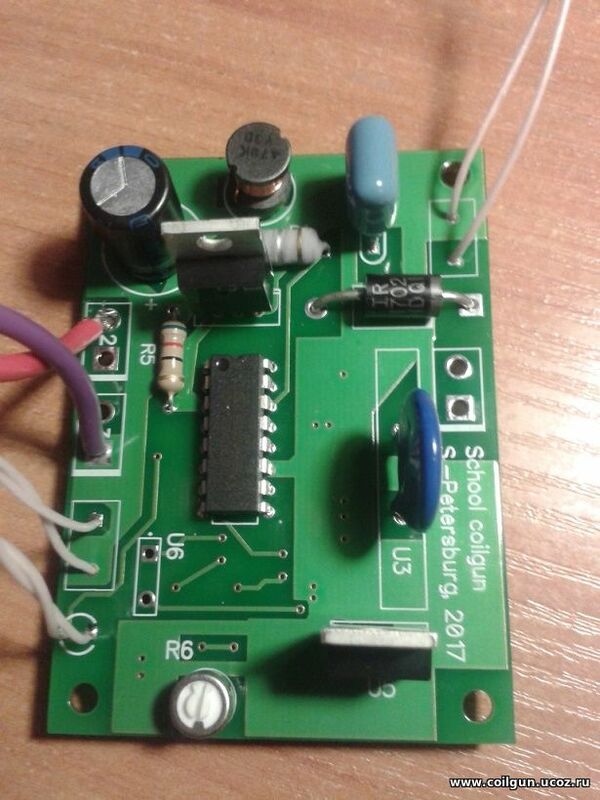 RESET input of 555 timer is connected to simple R7-C7 circuit with the resistor parallelled by internal diode of U2 IC - this allows instant grounding of the timer's output at power switch-off, and delayed permission at switch-on - this prohibits unintended shots. The capacitor are six 2200 mkFx 63 V, connected in parallel. 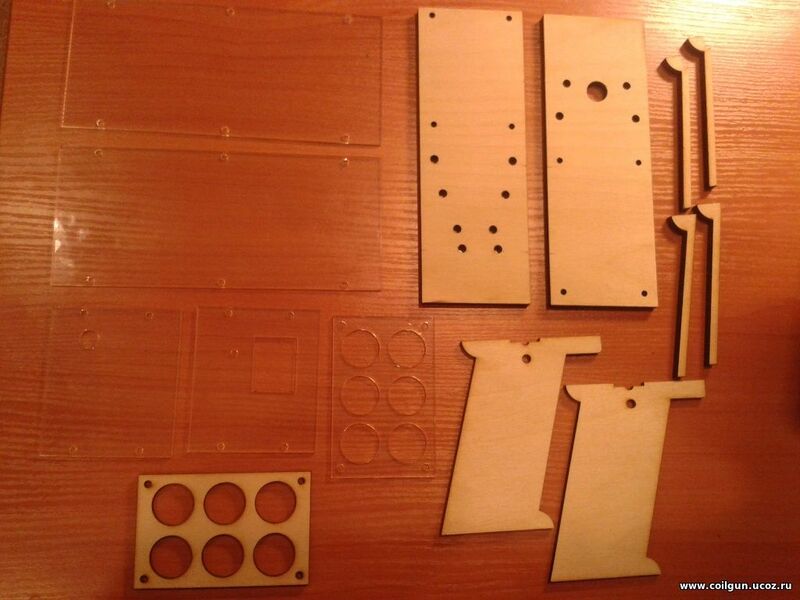 All the components are assembled on two-side printed board of 50x70 mm (pcb-files are here). It is shown on fig. 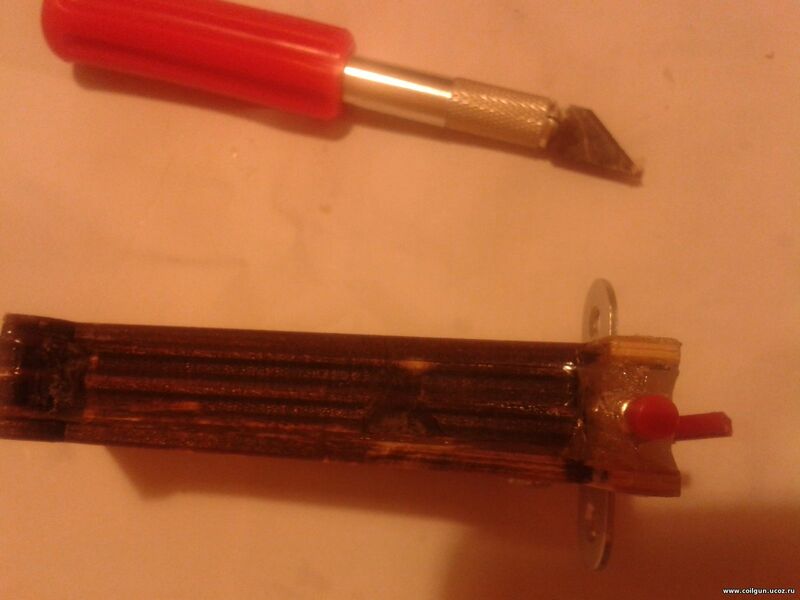 2 together with the aceelerating coil. 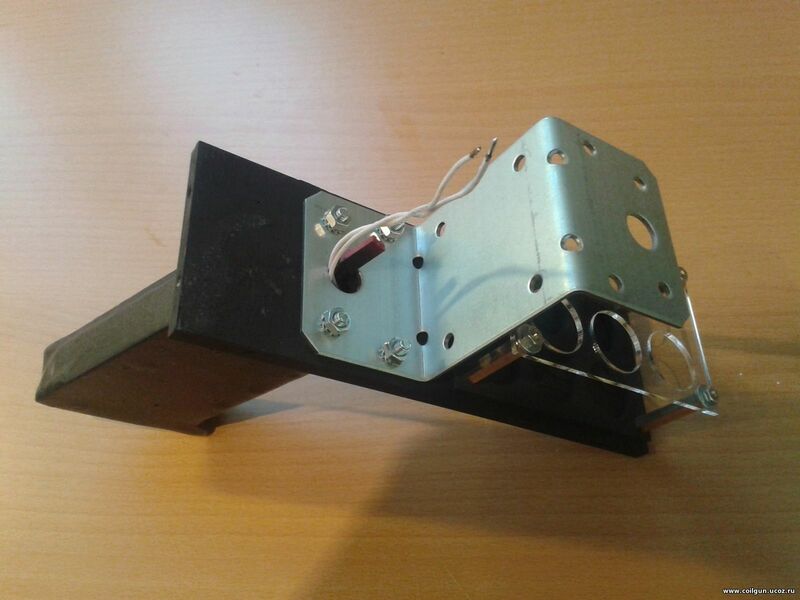 The only regulation of the scheme is attenuation of the accelerating pulse duration by R6 potentiometer. The optimal duration depends on the length of projectile ( I used 5 mm nails sawn and grinded). 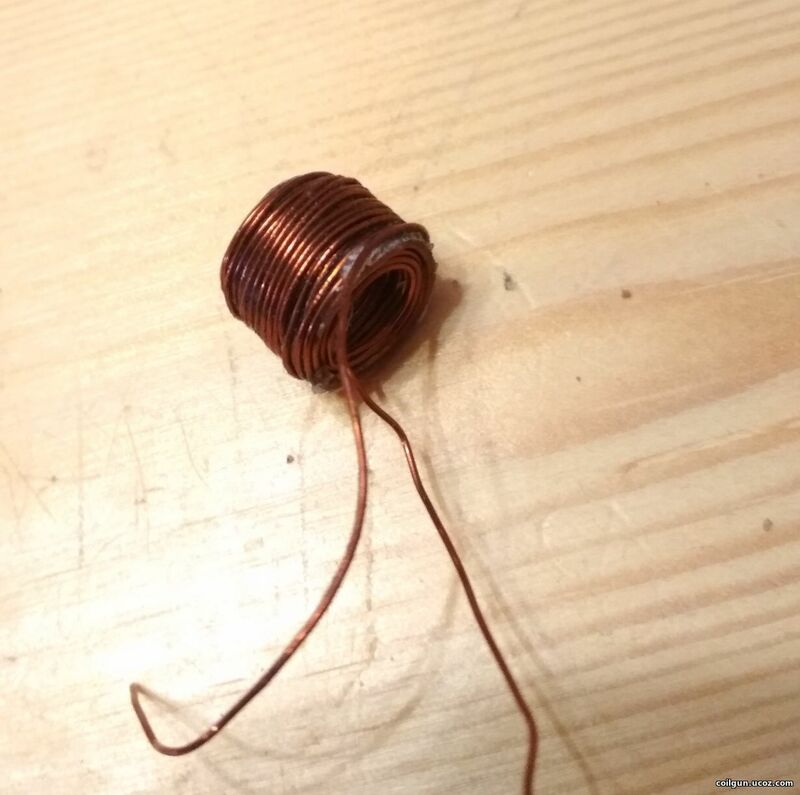 Accelerating coil has outside diameter 15 mm, inside one 7 mm and 14 mm in length, it is wound by 0.6 mm caliber copper wire. Its geometry and timing is calculated with a help of FEMM - this procedure is described here. Total turns count is 112, resistance - 240 mOhms. Current and voltage forms at shot are shown on fig. 3. Maximum current value doesn't exceed 180 A which is allowable for IRLB4030 MOSFET. Fig. 3. Votage and current forms according to FEMM-modelling. 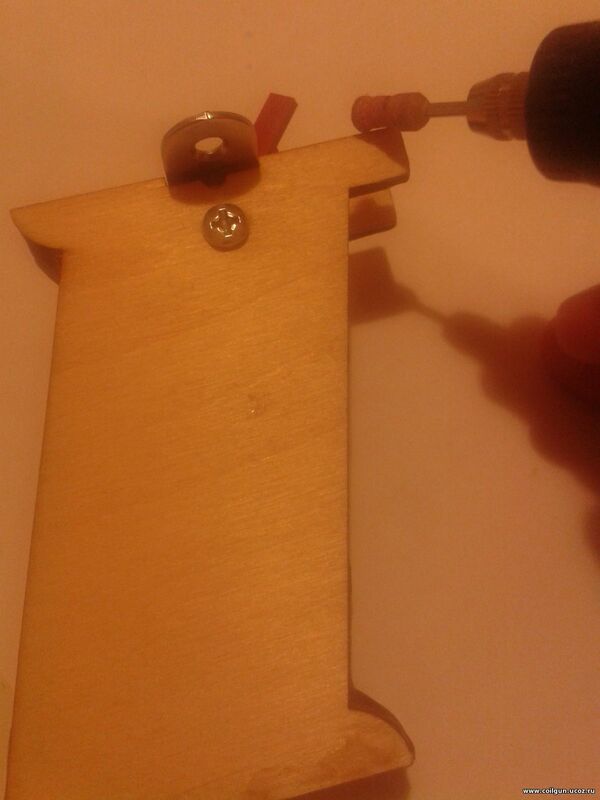 Laser-cut plywood and plexiglass panels were used for the case. 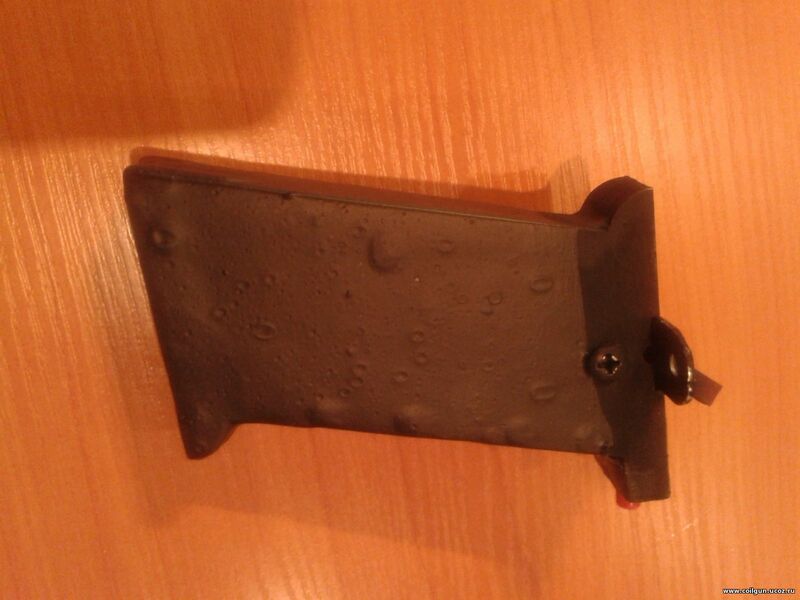 They were painted black before accembly, and the handle was additionaly covered with black "liquid resin". Processing of handle is detailed in fig. 5. 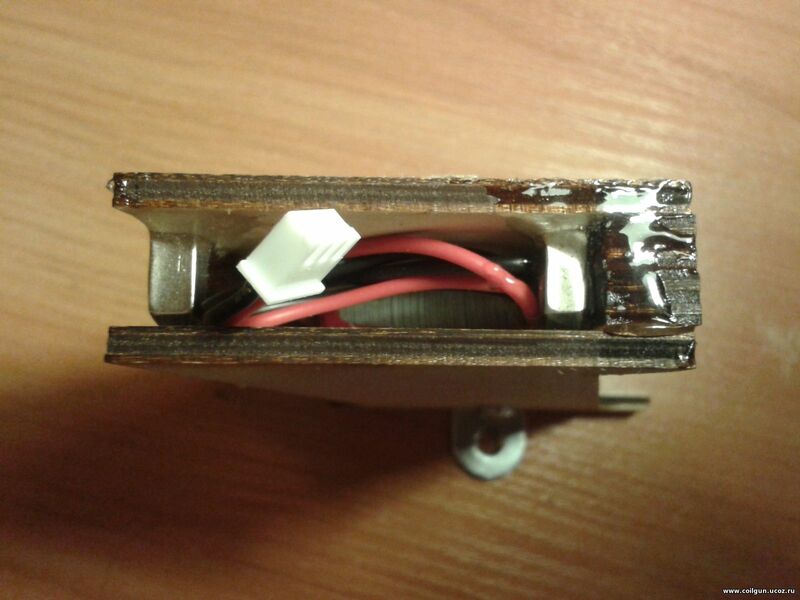 There is enough space inside it to carry accu with charging pulg (it is covered with small metallip strip-shaped cap kept by two small magnets). 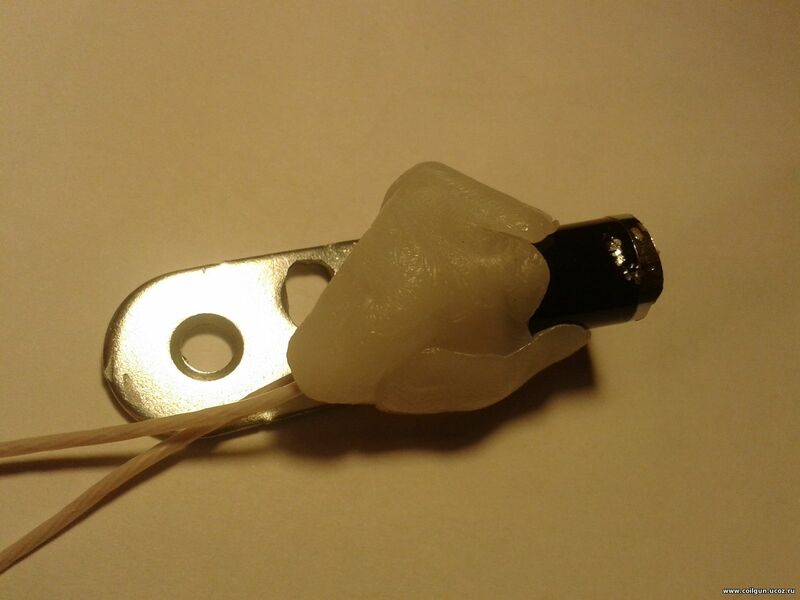 The power plug is directed upwards together with wires from "Fire" button (which is attached with simple thermoglue). Two small metal cornres served to connect the handle to the case. Fig. 5. Making the handle. 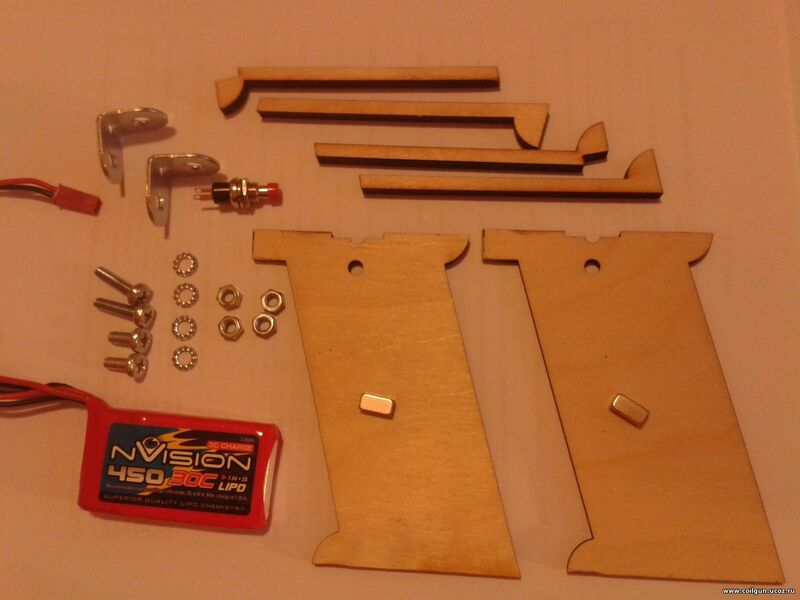 The case assembly process is shown on fig. 6. 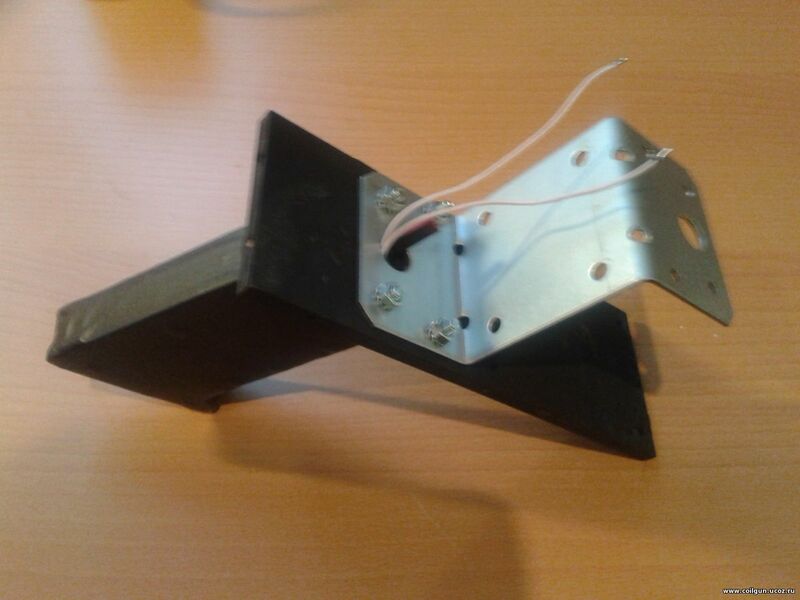 Only one strength element (steel profile) is used to connect upper and lower panels. 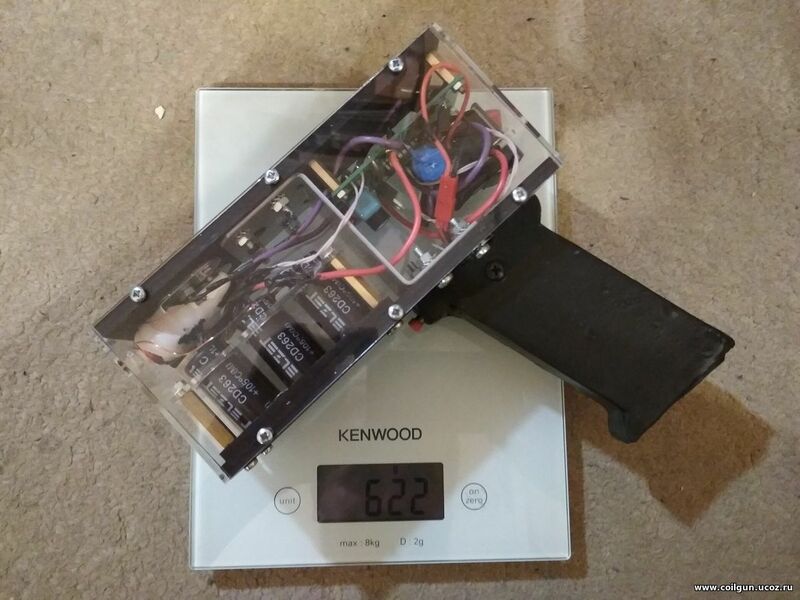 As a result, total mass of the coilgun makes 620 grams, 420 of them is the case. Fig. 6. Collecting the coilgun. 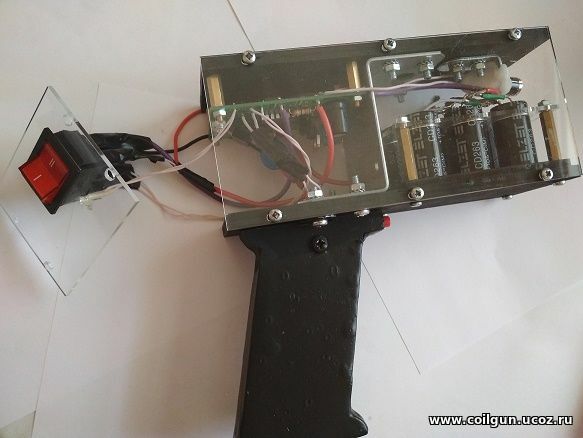 The coilgun is equipped with simple laser sight made of laser pointer - it was cut transversely to remove batteries and insert 200-ohm resistor which limits the current to safe 30 mA value while supplied from increased voltage (its original voltage is 4,5 V form 3 tablet batteries). 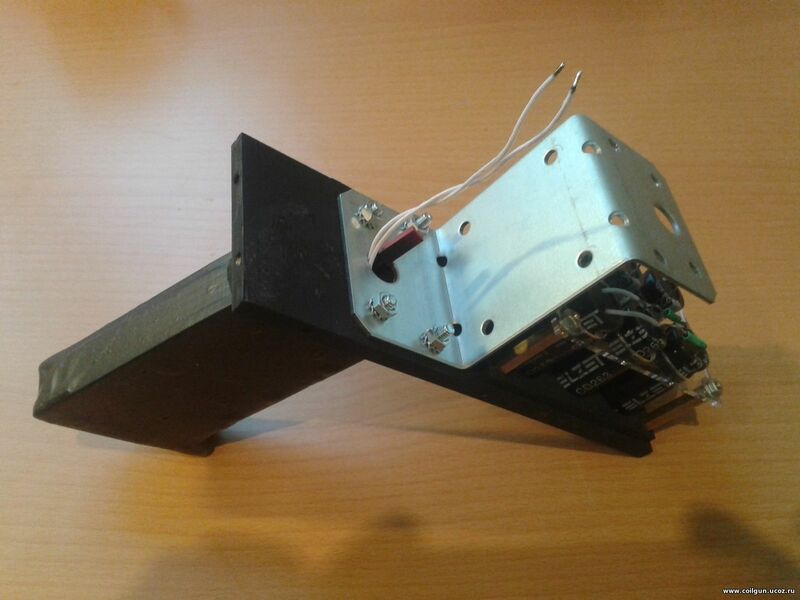 Then it was glued to small metal corner with "polymorphus" (special thermoplastic mass), mounted inside the case close to the accelerating coil, and directed such that the laser point coincides to the trajectory of projectile in a distance of approximately 3 meters. Fig. 7. Laser sight from a pointer. 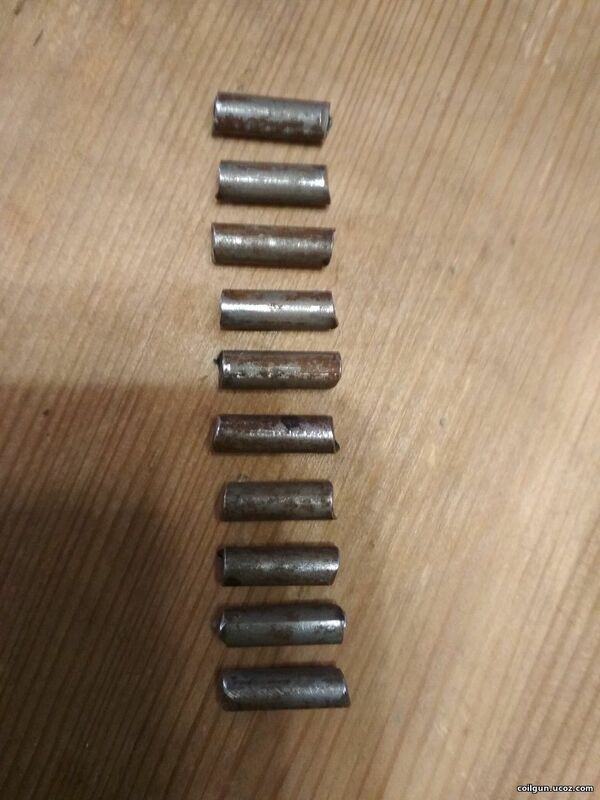 The projectiles as I said are pieces of 5 mm nails, their length is about 14 mm and mas approx. 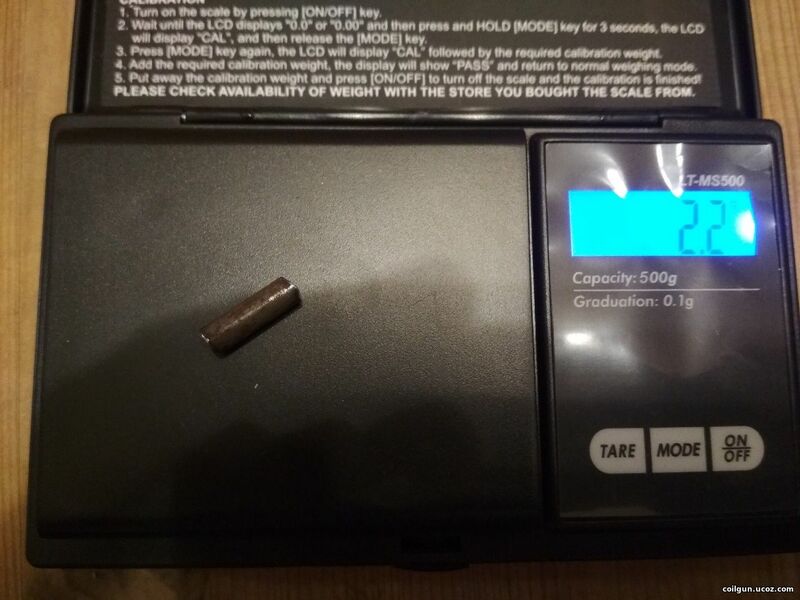 2,2 grams (fig. 8). They are accelerated to about 18 m/s which is safe for kids playing, but fast enough (you couldn't throw that bullets so fastly by hand ). Efficiency makes about 2,7 %, and about half of energy stored in capacitors is wasted per shot. Recharging takes about 5 sec. Fig. 8. Making and weighting the projectiles. Below are the videos of measuring the speed of EM-5, and its shots on plastic bottles. More photos are here, new videos will be stored here. P.S. Author appreciates D.E.Meleshkevich and P.Yu.Gromov for their help in this project.